Apeel Sciences, a group dedicated to fighting postharvest food loss, and European avocado and mango specialist Nature’s Pride, have joined forces in a bid to fight back against food waste in Europe. 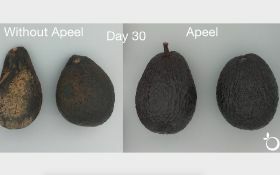 Subject to EU regulatory approval, Nature’s Pride plans to integrate Apeel’s plant-derived food waste prevention technology across its expansive avocado value chain, which will bring Apeel Avocados – avocados with double the edible shelf life on average – to European households for the first time. The Apeel and Nature’s Pride partnership comes at a time when food waste in Europe has reached 88m tonnes annually, with associated costs estimated at €143bn. The move builds on Apeel’s successful introduction in the US, where the technology has demonstrated a greater than 50 per cent food waste reduction at the retail level. As part of the partnership, Nature’s Pride and Apeel Sciences will introduce a co-branded label, a signal to consumers of quality, sustainability, and longer lasting freshness, and thus, less food waste, made possible by Apeel’s technology. “We put the health of people and the environment at the heart of all we do," said Adriëlle Dankier, chief commercial officer of Nature’s Pride. "We are constantly looking for improvements in our value chain to provide our customers with the highest quality and most tasty products. James Rogers, CEO and founder of Apeel Sciences, described food waste as a "massive global problem", and said that with a strategic leader like Nature’s Pride, they could look to a future where there’s much less waste in the system. “Nature’s Pride and Apeel have the same vision for a future where our food systems operate more harmoniously with nature, and we couldn’t be more thrilled to work with them to take the food waste fight to Europe very soon," he outlined. Avocado pilots are expected to start mid-year in select retail stores in Europe, subject to EU regulatory approval and both companies said they were excited to offer European customers and consumers Apeel Avocados.